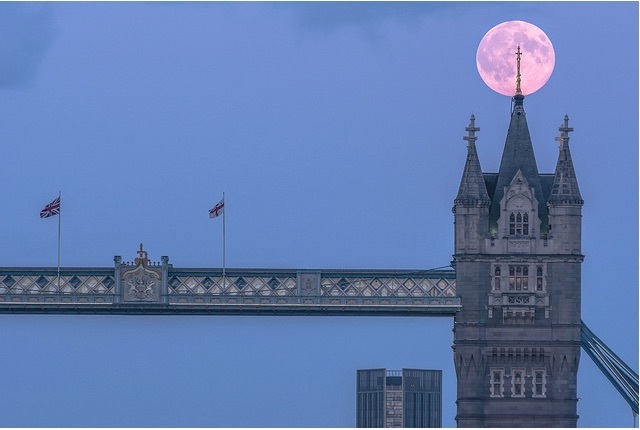 The super moon over London. It's prompted flood warnings. A mother of five who refused to be relocated from her Westminster council home has won a landmark legal battle not to have to move to Milton Keynes. Photos have emerged of the former Grosvenor pub in Stockwell, which looks set to be turned into flats. Flood alerts were issued for parts of west London due to high spring tides and the effect of the super moon. A double decker bus caught fire in south London — and was wrecked. A Chinese restaurant in Westminster has been named the best takeaway in the UK. Even more skeletons have been uncovered by Crossrail excavations. Great bit of photo detective work shows a view of Pickle Herring Street, where City Hall now stands, in 1947, and how much it's changed. A look at the regeneration plans for Tottenham — but are they threatening the character of the area? Photo by Naf Selmani via the Londonist Flickr pool.